Steps and staircases are all hindrances for those using wheelchairs or motorized scooters. 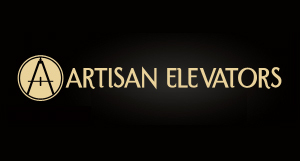 If you live in a multistory home or work in a commercial building, access to top floors is necessary and, if an elevator is not available, can be achieved with a platform stairlift. Similar in concept to a standard chair model, a platform stairlift consists of a flat space for a wheelchair or motorized scooter, side flaps, and various safety features. In order to support a wheelchair or scooter, however, a platform stairlift is put together with heavier construction. The surface area of the platform is large enough for a wheelchair or scooter to stay, and the platform itself is equipped with edge flaps, which can act like ramps and prevent the wheelchair or scooter from sliding off. Our own Indy Platform Stair Lift is designed with these points in mind. Based on our compact Indy Pinnacle model, the Indy Platform has a 25 by 36-inch stand, with side flaps, that folds at the top or bottom of a staircase. When folded, the platform is only 12 inches from the wall. Supporting up to 500 pounds, the system also has a wall-mounted guide rail, which offers stability when used as a handrail. The Indy Platform mounts directly to a staircase and travels up to 40 feet at 14 feet per second. An outdoor model is also available. A typical stairlift is equipped with such safety features as an emergency switch and sensor; a platform stairlift has this and more. 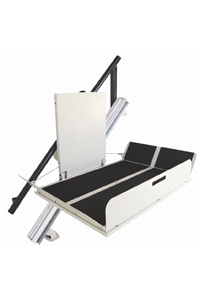 The Indy Platform Stair Lift is designed with a ramp obstruction sensor, an over speed governor, and a non-skid surface. Wheelchair platform stairlifts can be found in or outside homes or in front of commercial buildings. No matter its location, a platform stairlift increases accessibility of a multi-floor home or building for an individual using a wheelchair or motorized scooter.